Last week, we had a nice evening of hotpot with some Chinese and Dutch colleagues. Following a previous evening in which our Chinese colleagues cooked some wonderful dishes for us, now it was our turn to provide some food. Lazy as we are ;-) we decided on the typically Chinese and very 'gezellig' hotpot (huoguo). Herman and I love hotpot, did even before we went to China, so we have a hotpot set. A second one was borrowed, to give enough cooking room for all six people. Hotpot is a Chinese version of 'fondue', but much nicer in my opinion, because you can cook anything, not just meat. In that respect, it is more like 'gourmetten'. A pot (often divided into two halves) is put on the table and filled with soup(s). In this soup/bouillon all kinds of food are then cooked, such as meat, fish, shrimp, mushrooms, tofu, vegetables, dumplings and noodles. When the food is done, it is fished out with chopsticks or a little net, dipped in sauce and eaten. Delicious! 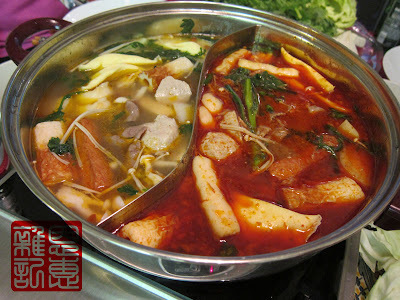 We love hotpot because it tastes great, it is easy to make vegetarian or vegan, everyone can eat as much or as little as they want, and at the end, you have a great soup, because all kinds of meat, vegetables and mushrooms have been cooked in it. The only disadvantage is that it is so delicious that we usually eat too much... My Chinese colleague Zee gave me some great tips for new things to try, such as winter melon (dong gua, very tasty), lotus root (anything with lotus root is delicious) and sweet potato noodles. We will definitely add these to our stock ingredients! After dinner, we got a chance to use Herman's mahjong set. Mike and I had never played before, so we got a Chinese coach :-), while Marlies and Herman, who had some experience, had to manage themselves. As with a lot of games, mahjong is easy to learn but hard to master. Playing the game is not so difficult (it is a little like Rummikub), but playing the best way so as to get the most points in the end is very hard. And of course, there are dozens of rule sets and everyone plays their own variant. Nevertheless, great fun and something to do more often. Next time, it is Mike's turn to provide food for us all. We have been promised barbecue (another lazy Dutchman :-), so let's hope for good weather!